I am delighted to unveil the coverage map of areas which will receive fibre speed broadband where previously there has been slow or inconsistent broadband coverage. Working with Imagine, we have brought the service to the north west of the county following meetings with residents and hearing their concerns around the lack of coverage in the area. As a member of the Oireachtas Joint Committee on Communications, Climate Change and Natural Resources, and someone who is passionate about improving our broadband services I am delighted to be able to let residents know of the service rollout which is live and taking applications now. A huge issue when I met with residents in the area was the lack of coverage in places like Newtown, Johnstownbridge, Carbury, Broadford, and Timahoe. All these areas will now have access to fibre speed broadband. 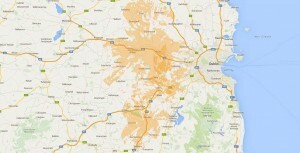 As people can see from the coverage map there is now comprehensive coverage across north west Kildare. It has been said time and again how important broadband is for the local community in terms of education and business. It is a credit to Imagine for working with me and appreciating the concern and demand from residents in the area. Thank you for visiting my site. I am a TD for Fianna Fáil in the Kildare North constituency. I was elected to Dáil Éireann in 2016 having previously served as a councillor for Kildare County Council since 2014. Please feel free to contact me on below details. Copyright © 2019 James Lawless TD All Rights Reserved.